Broad spectrum/UVB. Lightweight, non-greasy. Dermatologist recommended. Daily moisturizer with superior protection from skin aging UVA rays. 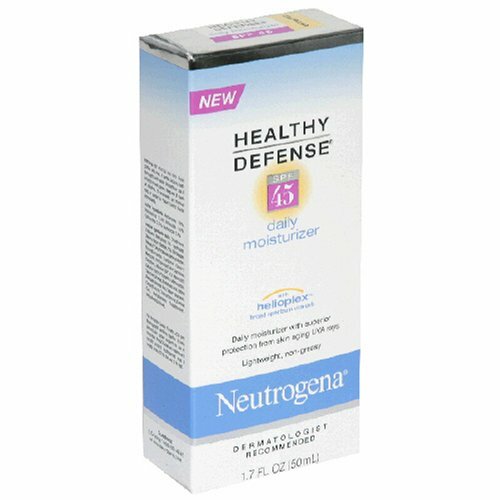 Healthy Defense SPF 45 daily moisturizer with helioplex, an advanced patented sunscreen complex provides superior anti-aging protection and moisturization. Protects: Helps screen out UVB burning rays and UVA skin aging rays to help prevent premature lines and wrinkles caused by the sun. Provides exceptional deep cellular skin protection. Prevents: Exclusive anti-oxidant blend with pure Vitamin E helps prevent environmental damage that may accelerate the signs of skin aging. Moisturizes: Lightweight, non-greasy formula absorbs quickly and keeps skin hydrated all day. The sun's UVA and UVB rays damage skin differently. UVB rays harm the skin's surface and are the primary cause of sunburn. UVA's more penetrating rays damage collagen and elastin that results in the signs of premature aging: fine lines, wrinkles, sagging, age spots. Made in USA. I am 39 1/2 and live in Phoenix, AZ ("Valley of the Sun".) I need moisturizer and sunblock, and it's nice when they are together so I can save a minute or so every morning. I have been using this for a little over a month, and have been very happy with it. 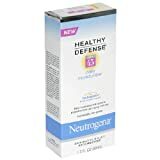 I also use the Neutrogena eye cream. You don't need very much of this to cover your face and neck. I haven't used up a full tube yet. First of all, once this sinks in it can hardly be seen on your face-lovely! Second, it hardly feels like anything. At the end of a long day I still want to wash it off my face, but it doesn't have that greasy/mediciny feeling like most sunscreens.